This paper provides a unified account of two schools of thinking in information retrieval modelling: the generative retrieval focusing on predicting relevant documents given a query, and the discriminative retrieval focusing on predicting relevancy given a query-document pair. Sculley et al. remind us that "the goal of science is not wins, but knowledge". Given a query and a set of documents, K-NRM uses a translation matrix that models word-level similarities via word embeddings, a new kernel-pooling technique that uses kernels to extract multi-level soft match features, and a learning-to-rank layer that combines those features into the final ranking score. This paper concerns a deep learning approach to relevance ranking in information retrieval (IR). We explore several new models for document relevance ranking, building upon the Deep Relevance Matching Model (DRMM) of Guo et al. (2016). Models such as latent semantic analysis and those based on neural embeddings learn distributed representations of text, and match the query against the document in the latent semantic space. In this work, we propose a standalone neural ranking model (SNRM) by introducing a sparsity property to learn a latent sparse representation for each query and document. 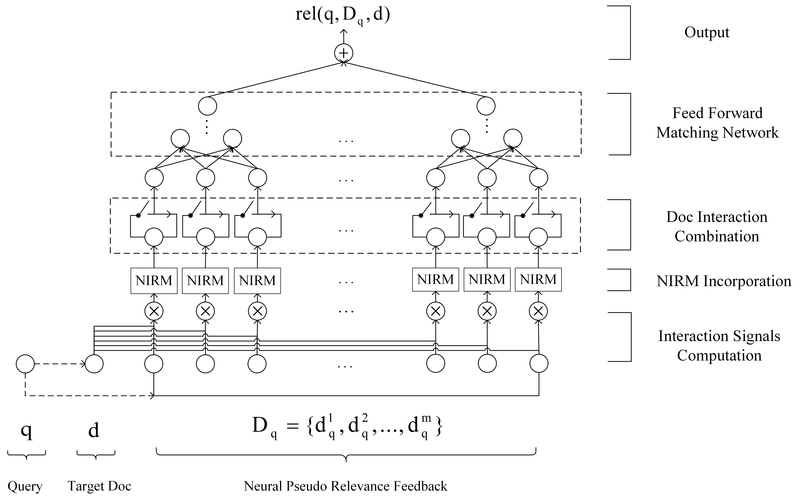 Neural IR models, such as DRMM and PACRR, have achieved strong results by successfully capturing relevance matching signals.